Whoo, what a day! To spoil the ending, I am now a private pilot. The checkride lasted a total of 3.8 hours! I also had a FAA examiner sit in on the oral portion of the exam and watch me perform the preflight inspection on the airplane. He said he would have flown with us if the plane had 4 seats. Thank goodness it only has 2!!! In addition, the winds were at a 60 degree crosswind at 9 knots (about 10-11 mph) gusting to 17 knots (19 mph). It was bad enough that the weather service issued a notice for moderate turbulence. When I finished, I was worn out! I arrived at the airport at 7:30am this morning to make sure I had everything. The checkride requires that you bring all of your documentation, airplane maintenance and log books, cross-country planning, weight and balance calculations and performance calculations for take-off and landing distances under current weight and weather. There are also multiple government forms to be filled out. I met with Greg, my examiner, at 9 am and we started shortly thereafter. We filled out more paperwork, including the Pilot’s Bill of Rights from the FAA (which Greg said was more like a Miranda warning than “rights”). We then started looking at log books and he asked questions regarding inspections and maintenance. He went through the Practical Test Standards pretty much sequentially (http://www.faa.gov/training_testing/testing/test_standards/media/FAA-S-8081-14B.pdf) asking dozens of questions. At about 9:30, the FAA examiner showed up and gave us the standard government briefing that he was there as an observer, not an examiner, and we were to continue as normal. However, he went over my logbooks and paperwork with a fine-tooth comb. 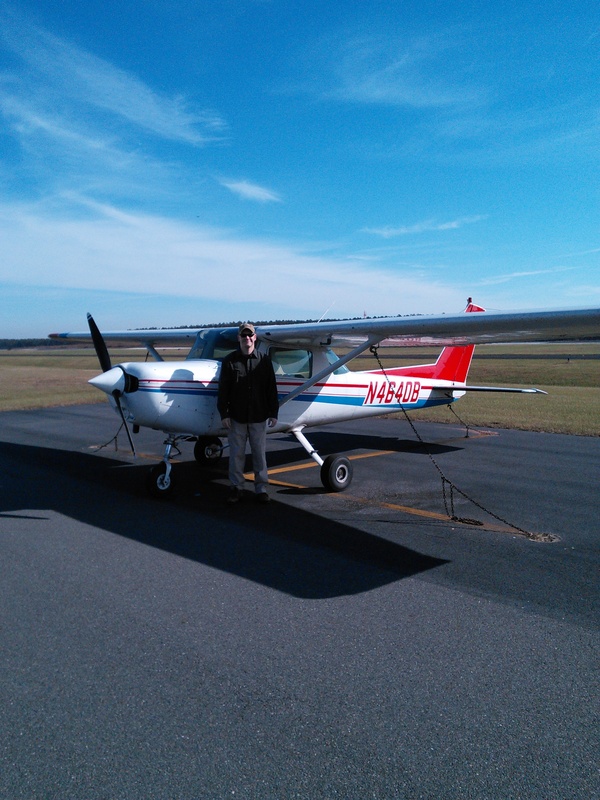 He found one endorsement missing, where my instructor had not acknowledged that I had passed a written test covering the systems of the Cessna 152 prior to solo (I had). 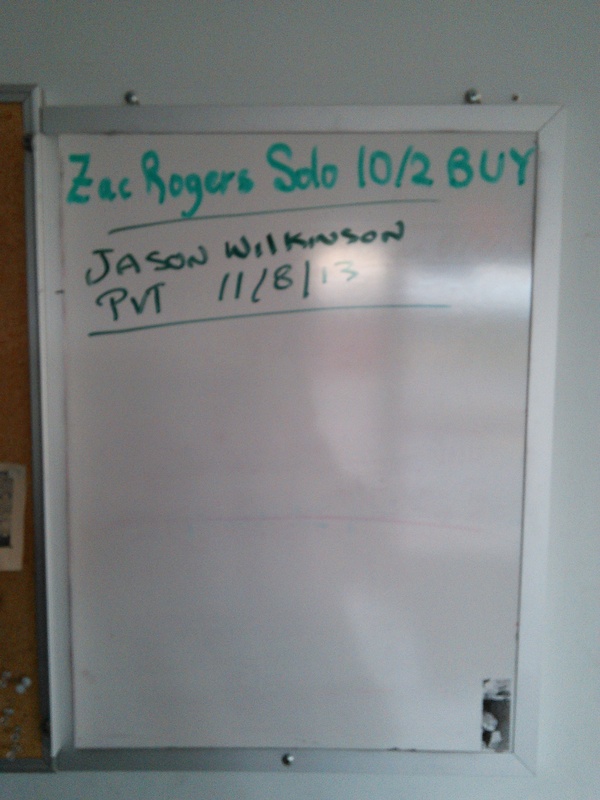 This caused some panic as he wasn’t going to let me continue the checkride unless I was endorsed. Unfortunately, Richard was in South Carolina. Luckily, the flying club had a record of my test in their files and the FAA was satisfied. Once Greg was satisfied with my knowledge, he passed me on the “oral” portion of the checkride. I then began to preflight the airplane with him and the FAA examiner. Nothing big, but a plastic fairing around the landing gear strut was loose and they wanted it tightened before flight. I found maintenance and had that done and away Greg and I went onto the flight portion. Man, was it windy and bumpy! The winds at 3,000 feet were at 30 knots (35 mph)! They were a tailwind for my faux cross-country and I reached my first checkpoint in 4.5 minutes, versus the 8 minutes it took on Tuesday. Once I reached the first checkpoint, Greg told me he thought the clouds had lowered and I was in the clouds so put on my “hood.” I flew by instruments and his instructions back to Raleigh Executive Jetport where he let me take the hood off to land. He then had me demonstrate a soft-field takeoff, fly up to 2,000 feet and perform steep turns and stalls, then fly back to the airport and perform a short-field landing. However, when I was downwind from the runway, he pulled the throttle and said my engine just quit. I performed an “engine-out” landing and included a forward-slip to lose altitude. He then had me take back off with a short-field takeoff, come around and land again in a short-field landing. At this point, he said to taxi back to the flying club, secure the airplane, and to stop by the terminal building if I wanted to pick up my temporary pilot’s license! Whew! The flight time lasted 1.4 hours. Now I think it is time to hit the sack. I didn’t sleep at all last night and got up around 5 am this morning for my 4 hour test. I am mentally and physically exhausted! Milestone number 1 is completed. Next up is to fly 50 hours of cross-country before beginning the training on the Instrument Rating. However, another hurdle is now financing. Flying takes money and we are going to need to raise some to continue on from here. I told Greg about Great Commission Aviation and he said that if it was meant to be, it would happen. I guess that can have some theological undertones. Pray that he is right. March 2019 Newsletter – Another Milestone!